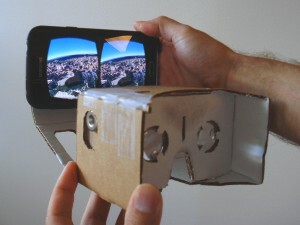 Google Cardboard is a design for a 3D virtual reality headset made with a smartphone and cardboard! 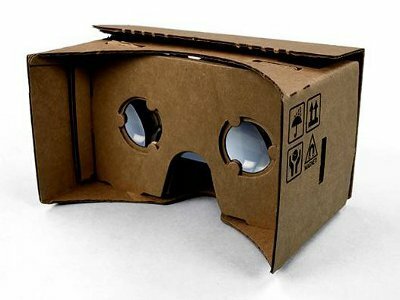 The free design online at Google shows the cardboard shapes you need and how to assemble it together. It also mentions that you need two lenses for focus, and two magnets. There’s magnets involved? We have to check this out. Most human beings use what is known as binocular vision to perceive depth and see the world in 3D. The binocular vision system relies on the fact that we have two eyes, which are approximately 3 in apart. This separation causes each eye to see the world from a slightly different perspective. The brain fuses these two views together. It understands the differences and uses them to calculate distance creating our sense of depth and ability to gauge distance. A simple way to understand this principle is to hold your thumb up at arms length and close one eye. Then try closing the other eye. As you switch between open eyes you should see your thumb "jumping" back and forth against the background. To see how much of a difference the binocular vision system makes, have a friend throw you a ball and try to catch it while keeping one eye closed. In original 3D movies, you might recall that glasses used a red filter over one eye and a blue filter over the other. Both red and blue images were projected on the screen, and the filtered glasses handled getting the correct image to the correct eye. More recent 3D movies don’t use red and blue filters. They used polarized lenses. Like many sunglasses, new 3D movie glasses allow only light that’s polarized in one direction to get through. Unlike sunglasses, the polarization is oriented in different directions. It's like having horizontal blinds over one eye and vertical blinds over the other. By projecting two images onto the screen with polarized light that’s 90° angled from one another, the polarized filters only allow one of the images to reach each eye. With virtual reality goggles, they don’t project two superimposed images on a movie screen and then filter it. Since the screen is right in front of your face, it is simply divided into two different screens. Each half is for each eye, without any fancy filtering involved. 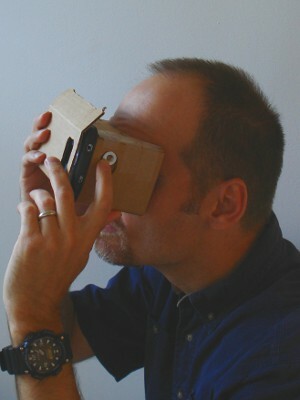 The cardboard box holds an Android smartphone in a position that’s in front of your eyes, with some lenses between them. On the screen, two slightly different images are shown on the left and right sides. Each one of your eyes is looking at the image in front of it. Because the images can be made different, a 3D effect can be constructed. But this is more than just a stationary movie screen. Because it is strapped to your face, you are free to move your head around and look all around you. Using the sensors in the phone to sense your position, the software creates a view that changes depending on where you're turning your head and looking. It feels like you’re inside a 3D environment. It is difficult to show how well this interactivity works in a blog post with pictures or videos. It really has to be tried. There are not many applications for it yet, but playing with the Google Earth demonstration is very cool. What is the magnet for? The magnet "switch" slides down, and attracts back to the up position. Because your phone is trapped inside a box, you can’t touch the screen. Without any screen input, the Google developers figured they needed some other way to add a button to the device. What could be added to the outside of the box that the phone could sense without touching it? Magnets! On the inside face of the cardboard, a weak magnet is taped/glued in place. On the outside, a neodymium ring magnet is attracted to the first magnet through the cardboard. Sitting in a slot, the user can slide the outer magnet down a little, and it will snap back in place when released. Smartphones have an internal 3-axis magnetometer: a compass (see iPhone Magnetic Measurements). By moving the magnet around, the magnetic field at the compass sensor’s location changes. The software app running on the phone can interpret this as input, like the flip of a switch. In the Google Cardboard app that looks at Google Earth, the magnet button switches between a hover mode and a moving mode. In hover, you stay at a fixed point in space but can look up down and all around at the scenery by turning your head. Slide the magnet and switch to moving mode, and you’re flying through canyons. You move in the direction your facing. If you turn your head, you’re flying in a new direction. When you activate the switch, that particular app makes a soft beep and briefly vibrates the phone a little, providing tactile feedback that the input was successful. In the Google Cardboard design online, they specify a weak ceramic magnet on one side of the cardboard, and a neodymium ring magnet on the inside. We guess this works, but seems a strange choice to us. The neodymium magnet is capable of demagnetizing and changing the magnetization of that ceramic magnet. Why not use a very thin neodymium magnet instead? To test it, we built our own cardboard to experiment with. Since we love neodymium magnets, we put a thin DC01 magnet on the inside and a ¾” diameter RC22CS-N countersunk ring magnet on the outside, like the one Google suggests. In practice with a Galaxy S5 phone, we found that this flipped the switch some of the time. It’s success was frustratingly intermittent. When we switch to the larger 7/8" diameter RE22CS-N, it did not improve matters. Interestingly, when we switched to the smaller, 5/8” diameter RA22CS-N, it worked much better. In the pictures below, we show and measure what the magnetic field looks like near these two magnets. K&J Measures the change in the magnetic field from a point near the magnets. If you are building your own Google Cardboard, we found that a DC01 disc magnet inside worked well with an RA22CS-N outside. You could also use a similarly sized DA01 disc magnet on the inside. If you have a different model phone, you may need to experiment a little. With the magnetic sensor located in a different position, you might need to change the location or size of the magnets. In general, we found the successful operation of the switch to be less than 100%. Some of us had a harder time getting it to work than others. You can build your own cardboard using the plans online. You just need the lenses and magnets. We bought the lenses on Amazon, using the link Google suggested. For magnets, you can get both magnets from us at www.kjmagnetics.com. A number of places have kits made up to save you the trouble of cutting the cardboard, typically in the $20-$25 range. Can you use an iPhone with the device? Not yet. At the moment, there isn’t an app for the iPhone that works with it. There are some apps for the Oculus Rift, a commercially available 3D goggle product that’s a bit more polished than cardboard. The two aren’t compatible, though. We found that the distance between the two images on the screen is different, so you really can’t use the Google Cardboard design with the apps we tried from the iPhone app store. So it's probably possible to make something, but the Google Cardboard design won't work with these apps out of the box.